Adult: Up to 1", bag - 1/4" to 1 1/2", and larva - 3/4" to 1"
Identification: Larvae hang in bags from twigs of trees. 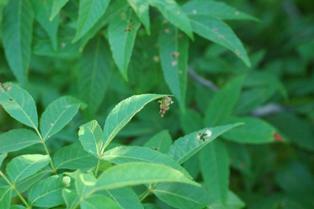 Bags are camouflaged with pieces of twigs and leaves from the host plant. Adult male is a black moth. The bag has a small opening at the narrow lower end that serves as a waste exhaust port. A wider opening at the top allows the larvae to crawl out and feed. Biology and Life Cycle: Newly hatched bagworm larvae make conical bags that they carry upright as they move. Adult females are grublike, have no wings or eyes, and are nearly hairless. The rarely seen male adult is a small flying moth. It has clear wings and feathery antennae and is sooty black. The female lays eggs in the bags in the fall, then goes through the lower opening and drops to the ground and dies. Larvae hatch and lower themselves on silk threads and attach on limbs where they start building their own silk bags. 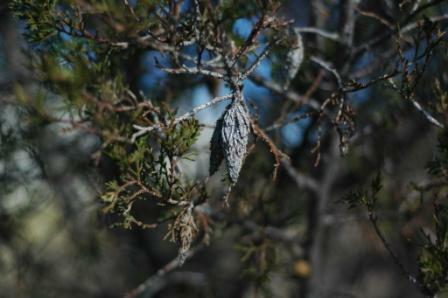 Habitat: The bagworm occurs in the eastern United States from New England to Nebraska and south through Texas. Ornamental trees and shrubs like arborvitae, junipers, fruit trees, and many others. 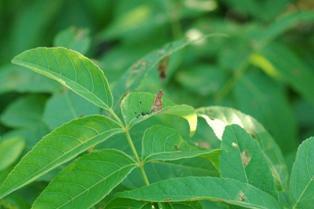 Feeding Habits: They eat foliage starting on the upper part of the plant. They live in and feed on willow, cedar, cypress, some pines, boxelder, locust, sycamore, maple, sumac, persimmon, and other ornamentals and fruit trees. Economic Importance: Defoliation of ornamental plants. 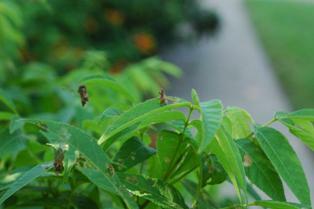 Natural Control: Wasps, birds, and several insect parasites and predators. Organic Control: Bt (Bacillus thuringiensis) products sprayed in the spring. Hand picking the rest of the year is by far the best technique. Plant oil products will also work. Insight: Since the female doesn't have wings or ever leave the bag, it is somewhat of a mystery how bagworms get dispersed. While the larvae are attached to single strands of silk thread after hatching, they may be blown a distance by the wind. The silk thread could get caught on an animal such as a bird and be carried a distance. Young female bagworms feeding on Mexican buckeye in the spring. This is the time when various organic sprays will kill them; Bt, orange oil products, essential oil products like EcoSMART and neem. This damage could have been avoided by releasing trichogramma wasps at leaf emergence. For more information on bugs see the Texas Bug Book. If you have any questions regarding this newsletter or any other topic, join me for my radio show heard in Dallas/Fort Worth across the country on Sunday from 8 - 11am (CT). Radio. To learn more on living a Natural Organic lifestyle, go to DirtDoctor.com.